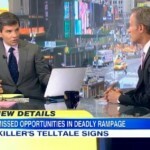 Dan joined the Good Morning America team on Tuesday, May 27th to discuss the tough legal questions surrounding the tragic shootings in Santa Barbara. The 22-year-old shooter had apparently been planning this attack for over a year and just minutes before sent out a 137 page manifesto to his therapist, among others. Although the therapist eventually called the police it was too late and the violent acts had already been committed. It begs the tough question, with all of these warning signs, could this have been prevented? What kind of legal obligations does a therapist have when presented with this type of information? Says Dan, “A therapist in the state of California, it does vary state to state, is required to try to protect the victims if: A. they are reasonably identifiable, and in the manifesto he did identify the roommates and others… but in California you have to do it [notify authorities] within 24 hours. It had been immediately but the law was changed to make it within 24 hours. But let’s be very careful. I don’t think any of that would have necessarily made a difference here. This was a very long manifesto. We don’t know for example, what the first therapist who saw it actually saw in the manifesto. Was she able to get through the whole thing? Did she see the part about the victims, et cetera. So, there’s a lot of questions here still to be asked, and it seems that he intentionally sent it at a point where no one could really do anything.” Watch the full clip here.